When Josh Ridley ’17 was a flight mechanic in the in the U.S. Air Force, one of his jobs was maintaining an F-15 Strike Eagle, a 16-ton, 63-foot-long jet fighter. Keeping the $36-million plane in top shape required a precise attention to detail that Ridley is applying this summer as he designs and builds a considerably smaller craft: a 4.5-ounce, teacup-sized, swimming robot. Ridley, of Saco ME, is one of four Vassar students who are using the tiny robots to study the evolution of artificial genetic systems. Under the auspices of the college’s Undergraduate Research Summer Institute, the research is part of a two-year project funded by a major grant from the National Science Foundation. The Other members of the team are Evan Altiero ’16 of Rockland ME, John Loree ’16 of Buffalo NY, and Jessica Ng ’16, of Brooklyn NY. The robots will be equipped with small electrical “nervous systems” and optical sensors with slightly differing genetic codes that will enable them to maneuver in the water to seek out a beam of light. The robots that are most successful at their task are rewarded with “offspring” that carry similar genetic codes. Altiero is working on the computer software that simulates mutations of the genetic codes, and Loree is building the electrical circuitry. 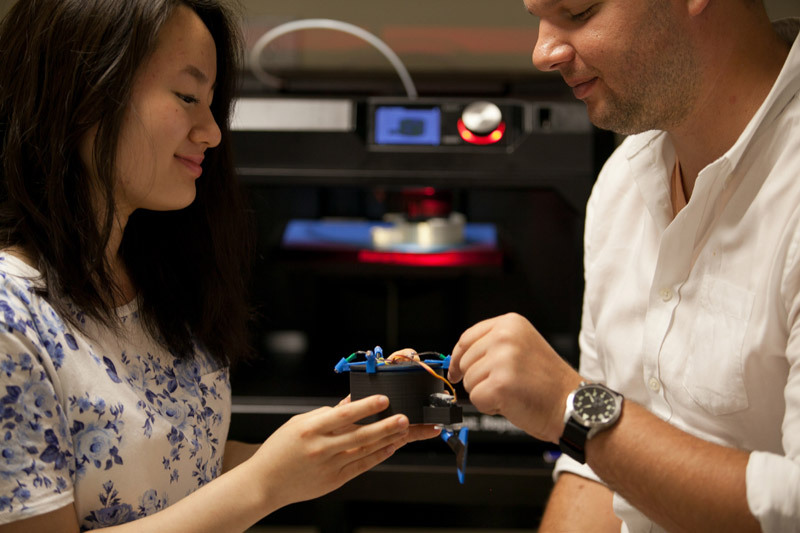 Ridley and Ng are charged with the task of designing the robot and using a 3D printer to build its shell. Now that the design has been finalized and the first robot has been built, Ridley and Ng will build at least a dozen more for the experiments the URSI team will carry out in tanks of water in the basement of Blodgett Hall. 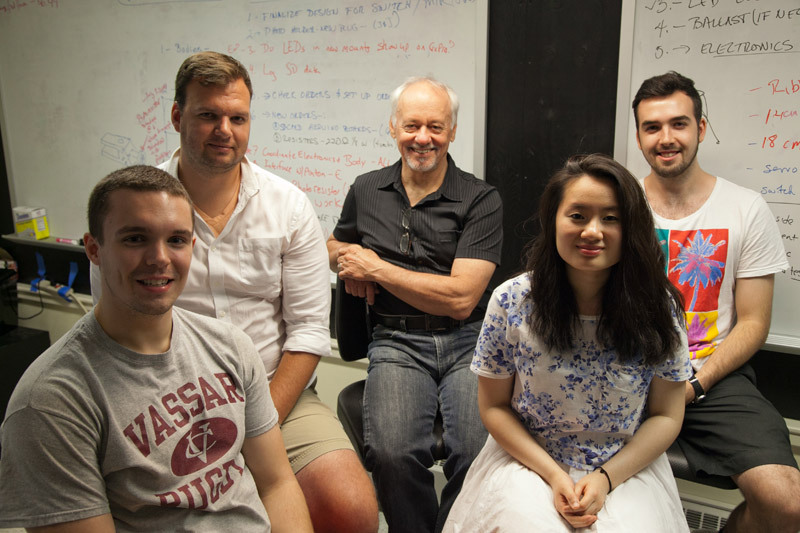 Cognitive science prof. Kenneth Livingston, one of five faculty members overseeing the two-year project, says he hopes to have the robots in the water sometime in August. The team will place up to 12 of them in the water at one time and watch them “compete” for the most time in front of the beam of light. Those that do the best job will have their genetic codes reproduced and refined over multiple generations in computer simulations that will be carried out by a companion team of students and faculty at the University of Vermont. Other Vassar faculty members involved in the project are biology associate prof. Jodi Schwarz, computer science associate prof. Marc Smith, cognitive science and biology prof. John Long, and faculty research associate and chief engineer Nick Livingston. Loree, a physics major, says he knew nothing about the project until he applied for the URSI grant but was quickly immersed in complex mathematical computations to help Altiero with the software. “I kind of stumbled backwards into this project, and never realized until now I could take part in research this complex,” he says. Loree plans to go to medical school and is interested in developing sophisticated prosthetics. He says he and Ridley often talk about how breakthroughs in the field would benefit many wounded veterans. Ridley says being part of a sophisticated research team this summer has been one of the highlights of his first year at Vassar. One of 11 military veterans to join the freshman class last year under the auspices of the Posse Foundation, he says he is gradually beginning to feel “more like a Vassar student and not just someone who takes classes at Vassar.